When I started planning out my army for Waaaghpaca I knew that I wanted to have an organ gun in the list. Motivated by by how well my drill cannon conversion (fills in as a grudge thrower) turned out I decided to come up with my own take on the Organ Gun. Plus I figured it would help to push the theme and paint score. Realizing that the existing model has multiple barrels I immediately started to think Gatling Gun. I hit the web (YouTube and google images) and researched some historical examples. This was really key for me to figure out how they went together from an engineering stand point. I also decided to start the conversion with the plastic Organ Gun / Cannon kit to reduce the cost and minimize the foot print. Next I set the ideas floating into my head to paper. 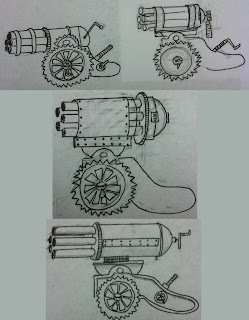 The designs below were done sequentially from top to bottom and you can see how the design developed over time. 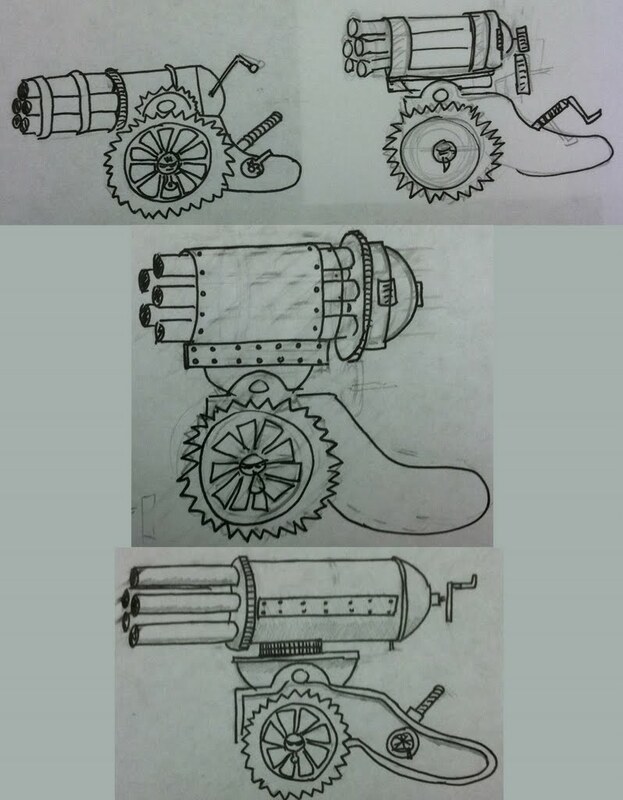 The drawing on the bottom is almost identical to final model except it only has 4 barrels instead of the 5 shown in the picture. The upper portion of the gun is primarily made from plastic tubing, green stuff and a few Dragon Forge gears. After assembly and painting the organ guns gears were fully functional. Fearing the movement would rub the paint I added some glue to prevent movement. For the crew I took my cue from the drill cannon crew by using the same helmets, armament and paint scheme. I'm really pleased with how the war machine turned out and I think it looks much better than the stock standard organ gun.